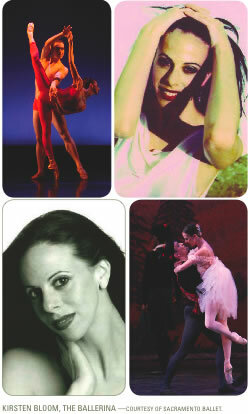 She carries the record as the longest running ballerina to dance for the Sacramento Ballet. 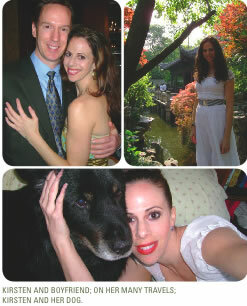 Kirsten Bloom has spent thirteen years in their Company. Now 35, Kirsten is dancing next to teens and twenty-year-olds. They are her competition. And in the world of dance, the competition is fierce. The leading roles have been hers. Kirsten has performed as the prima ballerina for more than a decade now, including such well known ballets as Romeo & Juliet, Hamlet, Don Quixote, Swan Lake, The Nutcracker, A Streetcar Named Desire, The Prodigal Son, and Sleeping Beauty. 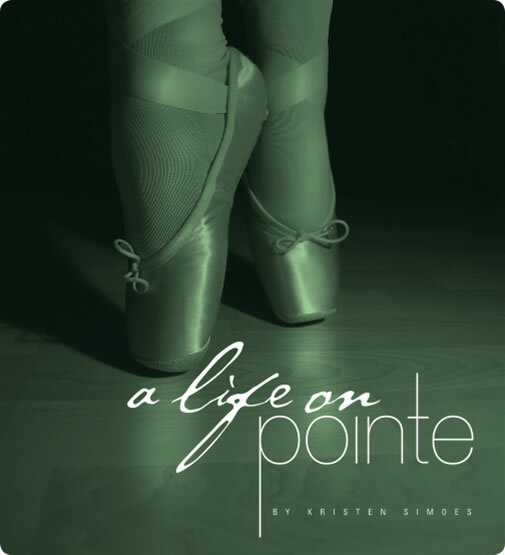 She is wrapping up her 18th season as a professional ballerina, and with the thought of retirement closing in on the not so distant horizon, Kirsten is thinking of the years ahead of her. “It is better to leave the stage, before the stage leaves you,” are haunting words to the ballerina. California Conversations sat down with the lissome leading lady of the Sacramento Ballet to dispel some of the myths from the storybook ballerinas of our youth. And here’s how it started: she ordered the bistro burger (complete with fries). She was friendly and eloquent, and surprisingly comfortable (yes, she sort-of slouched in the restaurant booth). She admits to being a bit clumsy, and to letting the occasional four-letter word slip from her dainty lips. She has an affinity for wine and an obsession with vacuuming. She is beautiful and real. She is refreshing. California Conversations: You’ve been here for a record 13 years. Kirsten Bloom: It is a record for the Sacramento Ballet. They’ve never had a dancer stay as long as I have. I feel a little bit like the old lady of the group. CC:	And you manage to not only keep up, you still run the show. KB:	Well, you kind of rise through the ranks and I was lucky. The first year I arrived injured, so I was only dancing about 50%. In the second season I healed completely. They quickly promoted me so I got to do a lot of principal roles and I decided that I would really stick it out. CC:	You became the Prima Ballerina. KB:	The Prima is generally the dancer who does opening night. They’re usually referred to as the Premiere or ‘Prima,’ not to be confused with Prima Donna. CC:	There is a stereotype about ballerinas being so into their art it is all encompassing and there’s time for nothing else in life. True? KB:	There is some truth to that, although I think people consider ballet to be somewhat of an elitist field and removed from normal society. I definitely don’t feel I’m that way at all. I am a normal person. My job just happens to be onstage performing classical ballet. CC:	You want people to be at ease around you. How do you want them to feel when they watch you on stage? KB:	Well I hope they feel moved by the art form. It’s so different now when you go to the ballet compared to how it was 200 years ago. The ballet or the opera used to be the thing to do. You would see a performance live and that was your inspiration for the month or for many months. But now we have so many means of entertainment, and it’s all very fast paced, and I think that makes it harder for our art form to stay alive. CC:	Do you see ballet continuing to evolve? KB:	I think ballet is modernizing, getting more contemporary. We’ve gotten wilder; a more improvisational performance art is out there now. We have to, or we will become a dying art. We fit our community because we’ve got the older group that may still want the classics and we’ve got the younger group who is more comfortable with the contemporary stuff. CC:	How many different productions do you offer in a year? KB:	In one season we usually do over a hundred performances. Fifteen to twenty of those are The Nutcracker. Four of those were Sleeping Beauty this year. Beer and Ballet is anywhere from fifteen to twenty new short pieces and Modern Masters is six different ballets. CC:	What does that translate to in terms of rehearsal time? KB:	We spend six hours a day, six days a week rehearsing. We have Sundays off unless it is a performance week. CC:	Is it exercise that keeps you so darn slim? KB:	It’s moderation. I eat. I love burgers and cheese. I just can’t eat it all. I was 17 when I started dancing professionally and my body was in a different place. I was heavier then. I went from being this thin little girl to being a woman and all of my instructors were telling me to lose weight. CC:	So dancers aren’t necessarily born with ‘dancer bodies’. KB:	No, and the body complex is very much a reality. It’s not that it’s spoken, you just won’t get cast. A lot of women in this field do have eating disorders. There is an undeniable emphasis on being thin. CC:	Is that one of the bigger challenges ballerinas face? KB:	For some it may very well be. For me, it’s been the physicality of it. The times when I have been injured, it’s frustrating because you want to get back so bad but your body isn’t ready. KB:	Yes. I tore my calf and was out for about nine months and in my mind I kept thinking I could do it. CC:	Do you consider ballet a sport? KB:	There’s a huge level of competition in it, so there’s a sports-like quality. CC:	Would you say you’re an athlete? CC:	How do you go from the dream every little girl has to being a ‘real life’ ballerina? KB:	That’s a good question. I started ballet as a little girl, just like a lot of others do. But for some reason, when I went into the ballet studio as a five-year-old, it felt spiritual. And I wasn’t religious at all. But at that young age, I felt the magnitude of the room and the magnitude of the dance, and I knew it was of a higher importance than my five-year-old brain could understand. I had this innate respect and love for ballet. CC:	Did you grow up going to the ballet with your family? KB:	No. I had a wonderful childhood with two devoted and loving parents, but we never went to the ballet. My dad sold construction equipment and my mom stayed at home with my sister and me. My sister is three years older and we started ballet together. She lasted only a few weeks but for me it was revolutionizing! CC:	Did you train with voracity from the beginning? KB:	No, it was one day a week until age eight and then it was three times a week. By the time I was twelve it was five days a week. CC:	And all your friends had stopped? KB:	Right. They moved on to soccer or something else. CC:	At what point did you know this was what you wanted to do for the rest of your life? KB:	I was twelve. I became a professional at seventeen. That was just it. It was weird. Nothing else ever entered my mind. I never wanted to do anything else, and I really am lucky that it worked out. I had to have the drive and the parents who were willing to take me to ballet class and buy my ballet flats and pointe shoes. It always just worked out, and it always felt right. CC:	After 18 years as a professional, have you found a balance between dance and life outside of the stage? KB:	I think so. I’m a very social person. I dance hard, and I play hard, and I have time for a wonderful boyfriend. KB:	No. He is a pilot, and a total guy’s guy. We met on eHarmony.com. He never even considered going to a ballet before. I know that now he loves coming to my performances. I think he enjoys watching me, but I also think he is genuinely interested in the art form. And he has come to the conclusion that I am one of the clumsiest people he knows. CC:	How are you clumsy? KB:	I think dancers tend to be very clumsy people. Like the other day I was taking the vacuum cleaner down the stairs and fell...vacuum cleaner and all, down the staircase.